Martha Catherine Kearney (born 8 October 1957) is an Irish-born journalist and broadcaster. She is the main presenter of BBC Radio 4's lunchtime news programme The World at One. Kearney was born in Edinburgh. From 1976–80 she read classics at St Anne's College, Oxford. In her final year at Oxford, she worked as a volunteer in hospital radio. She began her journalistic career at the London commercial station, LBC. In 1998 Kearney became a regular presenter of BBC Radio 4's Woman's Hour. In 2000 she became political editor of BBC Two's Newsnight programme. She went on to present Newsnight and its weekly consumer survey of entertainment and culture, Newsnight Review, with increasing frequency. She has been an occasional presenter of the Today Programme on Radio 4, and was a candidate to succeed Andrew Marr as the BBC's political editor in 2005, but lost out to Nick Robinson. Kearney featured in a spoof segment of the BBC comedy series Time Trumpet, titled Honey, I Shrunk Martha Kearney, in which Jeremy Paxman, in a fantasy version of Newsnight, interviewed her a third of her normal size. She also featured later in the episode in a spoof report from Notting Hill. In 2006 she presented with her father a Radio 4 series on the history of universities in Britain, The Idea of a University. Kearney presented her final Woman's Hour on 19 March 2007 and her final Newsnight on 23 March 2007. She became the main presenter of Radio 4's lunchtime news programme The World at One on 16 April 2007. She remains an occasional presenter of Newsnight Review, describing her current role as allowing her "to play to her strengths". 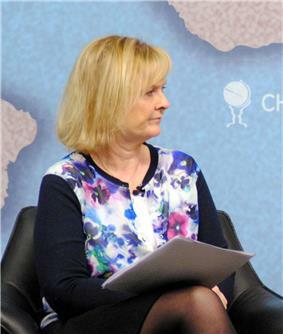 Kearney was nominated for a BAFTA award for her coverage of the Northern Ireland Peace Process in 1998. She was, with Jenni Murray, 2004 TRIC radio presenter of the year, and won a Sony bronze award for a programme on child poverty. In 2013, Kearney featured in the Great Comic Relief Bake Off. In 2014, she presented The Wonder of Bees, a one-hour programme on BBC Four about the worldwide disappearance of bees. In 2015, she presented The Secret World of Lewis Carroll, a one-hour programme on BBC Two. In 2002 Kearney was a judge for the Webb Essay Prize. In 2005 she chaired the judges for the women-only Orange Prize for Fiction. Kearney chaired the judges for the 2012 Hippocrates Prize for Poetry and Medicine. Kearney married Chris Shaw (born 19 June 1957), senior programme controller at Five television, in July 2001 at Depwade, Norfolk. The couple live in Suffolk, where Kearney is also a part-time beekeeper.